We learned while in a strange, airless, windowless trailer-like military court at the infamous Ft. Meade, during the trial of Bradley Manning on Thursday, June 28, that the U.S. military has blocked access, worldwide, for anyone in the military to the website of The Guardian, apparently in reaction to the leaks by Edward Snowden on vast surveillance of whole populations by the National Security Administration. Ironically, or not, Ft. Meade is the home of the NSA. This is all backwards, to risk understatement. The crime of aggressive war is the supreme war crime. To have waged such a war, destroying a country’s infrastructure, society, displacing millions, displacing and killing uncounted numbers — and all on the basis of lies, as was the U.S. war on Iraq — is the criminal offense we should be trying the leaders of the Bush regime for. History is being made in this courtroom, but as is often the case in the proceedings of empire, on the surface, the proceedings are banal. The judge takes pains to point out Bradley’s rights as accused, all the better to not be reversed in an appeal. The large team of prosecutors comes and goes with stacks of files, as if this is business as usual, and as if “justice” will be served. Each morning the lead prosecutor informs the judge of how many members of the media and the public are present. There is a lot of talk about the rights of the public, while the public is searched, told not to talk, and treated as the “enemy” we are. Peter Van Buren, a former Foreign Service Officer for the State Department who helped lead two Provincial Reconstruction Teams (PRT) in rural Iraq from 2009-2010, told Firedoglake that none of the cables from the US Embassy in Baghdad that Manning is charged with disclosing to WikiLeaks jump out at him as “anything special or concrete.” He suggested that many of them were reports done by State Department employees as if they were journalists. The fact that none of the cables appear to be any that received widespread attention in the media when WikiLeaks published them is, to Van Buren, a possible symptom of the State Department’s “schizophrenia about WikiLeaks.” They have wanted to claim the release of cables was an “incredible crime against the US government” while at the same time wanting to “reassure” leaders of countries around the world that the “really important stuff was protected” and not compromised. The prosecution attempted to get the judge to allow them to submit tweets from WikiLeaks as evidence that Bradley was working with WikiLeaks, providing what they asked for. We learned that the prosecutors hadn’t subpoenaed Twitter for those records, and had someone find them on Google, perhaps because they know they don’t have to work very hard here to get a “guilty” verdict from the military judge. The judge did deny one 2009 WikiLeaks tweet into evidence, but allowed others. 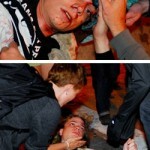 Everyone needs to see the video Bradley Manning is accused of releasing: Collateral Murder. Request a DVD copy. Distribute this flier. A small defense victory Thursday came when the judge seemed to indicate she’ll allow them to submit evidence arguing that the Collateral Murder video of the July 2007 Apache helicopter attack killing 12 Iraqi civilians was no longer “classified” by 2010 when Manning sent it to Wikileaks. It’s worth noting that this footage was sought by Reuters, (who employed two of the men killed in the attack) for three years, unsuccessfully. On cross-examination, Col. Miller testified that there were no restrictions on surfing the SIPRNet, the military’s Secret-level internet, where he perused the State Department’s Net-Centric Diplomacy Database. He also said that soldiers were allowed to download files to their computers and to digital media, such as CDs, and there were no restrictions on the ‘manner’ in which a soldier could download. This refutes the claim that by using the download-automating Wget program, Manning exceeded his authorized computer access. The prosecution will rest July 1 or 2. After the holiday weekend, on Monday July 8, the defense will begin. Let this be a day where the prosecutor has to tell the judge that the media trailer is full; the public seats are all taken, and the overflow trailer is also full. If you can’t get to Ft. Meade, join in the conversation online; send donations; talk to everyone you know about this case, and why telling the truth should not be a crime. And, order a copy of Collateral Murder to show, to project outside, to share. What is so dangerous about this footage that Bradley should spend life in prison for releasing it? It shows war crimes, done in our name. 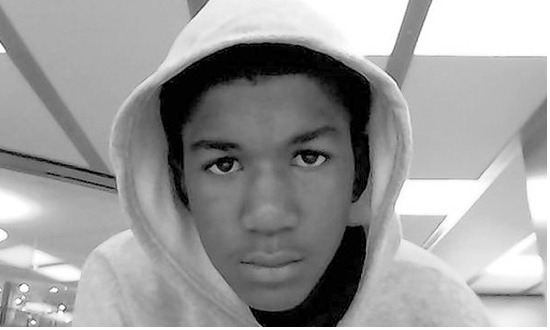 This is not justice; never could this be justice… The verdict was ordained long ago. Its function is not to determine questions such as guilt or innocence, or truth or falsehood. It is a public relations exercise, designed to provide the government with an alibi for posterity. It is a show of wasteful vengeance; a theatrical warning to people of conscience. 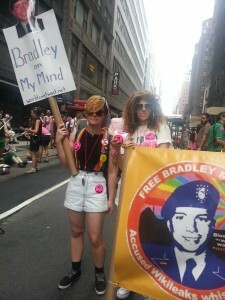 Say It Louder than Ever: FREE Bradley Manning! 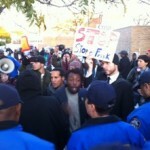 I was sitting in a Brooklyn court room last week, listening to police testify for prosecution of freedom fighters who protest NYPD stop-and-frisk. (Later that day charges were dropped by the judge). At the same moment, Bradley Manning was giving a first public statement on releasing documents on U.S. war crimes, including what came to be called the “Collateral Murder” video, the U.S. diplomatic cables, material on indefinite detention in Guantanamo, and Afghan War Diaries and Iraq War Log. Manning accepted responsibility for some of the charges the US government has made, opening himself to two years prison on each of ten counts. What is most disturbing is the government’s intention to try him on June 1 for the remaining, more serious charges, and to ask for life in prison. Monitoring my phone on breaks in the trial, we heard via Twitter that Bradley had tried the Washington Post, The New York Times, and Politico, before uploading the data to Wikileaks, with the urgent intent of getting the public in the U.S. to engage in a debate about war policy, based on knowing what their government is doing. 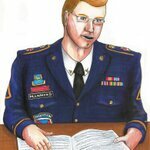 Alexa O’Brien provided a transcript of the statement Bradley Manning made in military court last week, well worth reading through. Preparations to rally at Ft. Meade, Maryland, site of the trial are being made now. The Bradley Manning Support Committee reports on international support actions February 23, 2013. While saddened by the aerial weapons team crew’s lack of concern about human life, I was disturbed by the response of the discovery of injured children at the scene. In the video, you can see that the bongo truck driving up to assist the wounded individual. 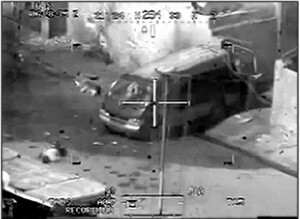 In response the aerial weapons team crew– as soon as the individuals are a threat, they repeatedly request for authorization to fire on the bongo truck and once granted they engage the vehicle at least six times. What the video depicted was the truth of war. There were completely inhuman things—laughing about killing people, laughing about rolling over dead bodies with tanks. It was just abominable and reprehensible and sickening. When you watch it, it just makes you gasp to hear the language. But this is not an aberration. This is the truth of war. And that’s what we need to convey to people. 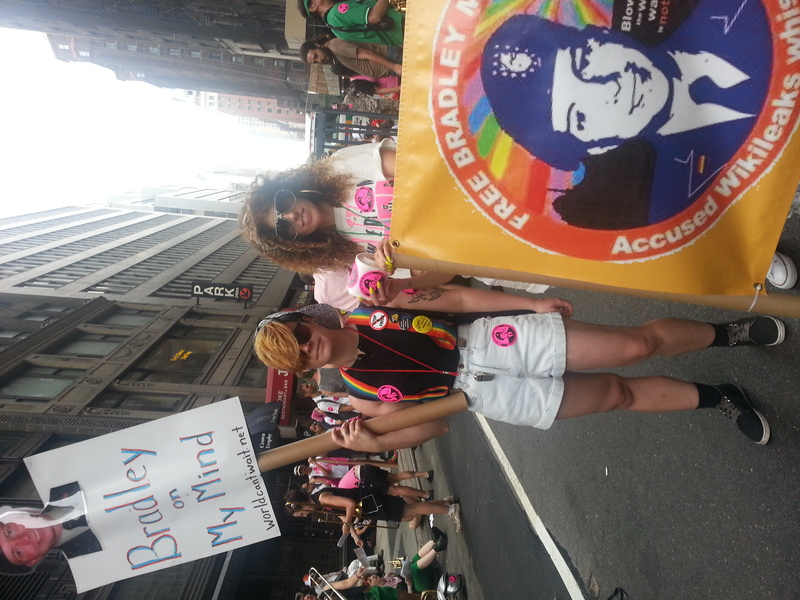 What Bradley Manning did was a huge service to the world, to let people know the ugly, awful truth of war. Let us know you would like a copy of the Collateral Murder video on DVD (click here to see how to show the DVD out on the street). We are distributing these along with the Afghan War Diary documents released by Wikileaks. I have no doubt the government will continue to pile on Bradley Manning with all the force they have. That an Army private, so articulate, so clearly out for the benefit of humanity, as opposed to personal gain, could begin a mass public reaction that brought down reactionary governments in the Middle East, and expose the U.S. for its illegitimate use of military force the world over, is dangerous to them. Much more dangerous, than say, CIA torture of thousands or the destruction of whole countries. 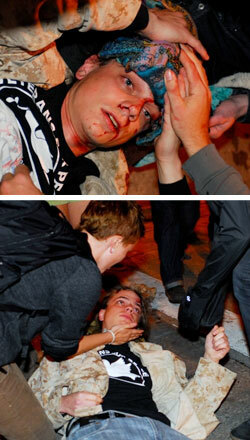 Virtually no one is being prosecuted for those crimes; yet, Bradley Manning faces life in prison for exposing them. This is a case of extraordinary prosecutorial overkill. The government has never been able to identify any substantial harm that has come from any of the leaks that Bradley Manning is accused of and now admits to being responsible for. Certainly nobody has died as a result of these leaks, even though the government originally said that WikiLeaks and the leaker has blood on their hands. Journalists investigated and found that there was no evidence for that. So, just the very idea that he should spend decades in prison, let alone be faced with life on parole, given what it is that he actually did and the consequences of it, is really remarkable. In the chat logs that were published over a year ago with the government informant who turned him in, he said very much the same thing while he thought he was speaking in complete confidence, to somebody who had promised him confidentiality, about what led him on this path, that he had become disillusioned first about the Iraq war when he discovered that people they were detaining weren’t really insurgents but were simply opponents of the Maliki government, and he brought it to his superiors, and they ignored him. He then looked at documents that showed extreme amounts of criminality and deceit and violence, that he could no longer in good conscience participate in concealing. It was really an act of conscience, pure conscience and heroism, that he did, knowing he was sacrificing his liberty. 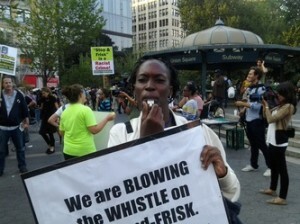 We are BLOWING the WHISTLE on STOP-and-FRISK. No more STOPS and ILLEGAL SEARCHES in SILENCE. Join in! Most of the action Thursday September 13, in the new campaign to Blow the Whistle on Stop-and-Frisk was in the areas most heavily targeted by NYPD. 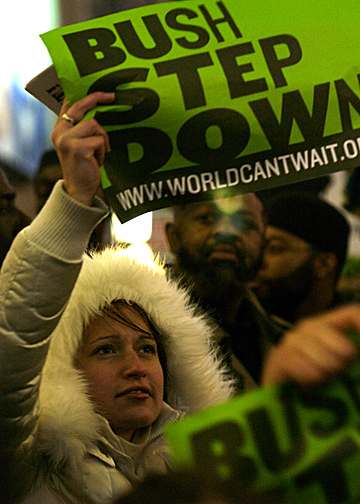 Organizers were in The Bronx, Brooklyn, Harlem, Jamaica Queens, and Staten Island. By the end of the day, 20,000 whistles had been distributed. 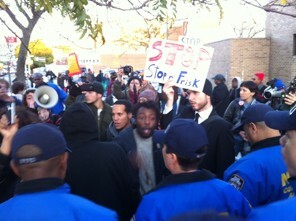 We did not know that many civilian employees of the NYPD would agree with us that stop-and-frisk should be ended. One of them signed up with us; others said they would lose their job if they spoke out. Journalists from Mexico and China interviewed us. We got so into getting whistles out to people walking by — including lots of mothers who wanted them for their kids who are targeted by NYPD — that we were almost late to Union Square, where people were waiting for us. About 75 people gathered up to participate in a mic check to blow the whistle. I was glad to see supporters of World Can’t Wait answer the call to come out. Reginald, one of the organizers, told the crowd that he’s 60 years old, has masters’ degrees and has traveled the world. He got stopped in Brooklyn near his home. The cops said, “let us see your drugs. You take drugs, don’t you?” Reginald told them that he takes the drugs his doctor prescribes. They let him go, but he doesn’t want to see others have to go through that. Several Wall Street Occupiers talked about their experiences, and the role of the police across the city, including the murders of Ramarley Graham and Reynaldo Cuevas by NYPD. We blew the whistle a lot! Especially at 6:00 pm, you could hear the whistles as you came up the subway steps. People came to check out the scene, and some of us did a group photo. The deal with “blow the whistle” is to make some noise, wherever you are, when you see someone being stopped and frisked or rights being abused by the NYPD. We are out to change the situation where people are stopped and feel alone or humiliated by the police. When you see something, blow your whistle. Others will hear you. Ask them to get out their phones or cameras. Remember, you have the right to observe and document police conduct. They don’t have the right to abuse anyone, and you don’t have to quiet when you see them doing so. More information at stopmassincarceration.org. 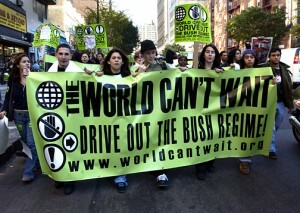 War Criminals to Meet in Chicago, But Somehow Protest Will be the Danger? Update May 8: “On Tuesday, city officials notified National Nurses United that they were ordering nurses to accept new, less visible, locations for the protest, under threat of cancelling a long approved permit for the public event – even though the G-8 leaders will now be 700 miles away from Chicago on that date in the backwoods of Camp David, Md.” At a press conference Wednesday, “NNU will outline a legal challenge to the city’s demand and discuss other plans responding to the city’s move” (from a press release from National Nurses United regarding the suppression of their planned May 18 protest in Chicago against the NATO Summit). Military tribunals, the crowning achievement of a US system of indefinite detention and torture aided by and including NATO member countries, and which defense attorneys assert are rigged by the U.S. to assure the execution of 5 men in Guantánamo, have begun, in the process of continuing the unending U.S. war on terror. U.S. drone strikes, halted briefly because of protest from the government of Pakistan (presumably a sovereign country) began again last week, killing 4 people in a school. Of course these victims were called insurgents; everyone killed by U.S. drones is a militant, by definition. NATO is now a major purchaser of U.S. drones, and has a vast role in aiding the covert U.S. strikes. The most heavily armed empire in world history occupies and has destroyed whole countries, has a system of indefinite detention and torture in place, and is expanding secret military operations across the region. But according to this empire, the biggest danger to peace is some hundreds or thousands of people protesting the Chicago meeting of the NATO military alliance next week? According to the purveyors of war crimes, the people decrying the destruction of Afghanistan, Iraq and Pakistan are the ones to fear and lock up, while the war-makers and torturers are given even more power to war critics into criminals? Public opinion is being prepared for this criminalization. The Chicago press has featured reports on plans to evacuate Chicago because of “unrest;” on the deployment of National Guard troops to quell protests; on plans to reopen a closed prison in Joliet to house arrested protesters; on heavily armed federal teams sweeping through the central city; on closing down the public transport system in the city; and more. Despite the measures which Mayor Rahm Emmanuel, Obama’s former White House enforcer, wanted in place against protest, a well-publicized battle was successful in getting a permit for the march on Sunday May 20 at Grant Park. With the removal of a long-held permit to march on Friday May 18 by National Nurses United, the City is trying to force protest further away from city center, supposedly because rocker Tom Morello will be performing at their rally. No matter how they parse the words of the First Amendment, what the federal authorities (who are the ones running the show in Chicago) are doing is criminalizing protest in advance. 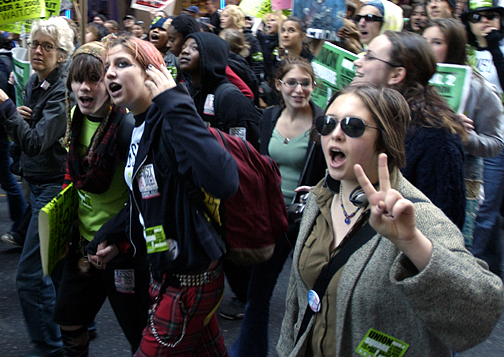 As they did at the Republican Convention in St. Paul in 2008; at the G-20 in Pittsburgh in 2009; in response to the Occupy movement, they are putting measures in place that will sweep up people who are assembling and speaking based on the content of our protest message. The message to the general public is that protest should be feared, not a system that perpetrates war crimes and mass denial of civil liberties. * Sending arrested protesters to an old prison in Joliet. The idea was then ditched, as the place is falling apart (To Joliet jail for NATO offenders? 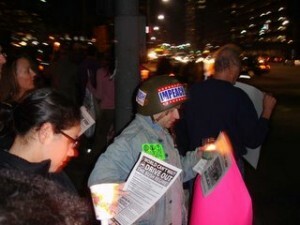 Sun-Times, Apr 28, 2012). Video of military helicopters flying over the Loop. According to a chapter spokesperson, the evacuation plan is not theirs alone. “Our direction has come from the City of Chicago and the Secret Service,” she said (accompanied by picture of demonstrators amidst flames, who knows where…). * Surgical strikes against anyone in protests who “crosses the line” beyond First Amendment activity… as defined by the Secret Service? “Police will embrace “First Amendment activity,” she told the building managers, and will surgically deal with those who cross the line into vandalism. She was asked how many demonstrators could arrive in Chicago who aren’t now part of a permitted group. “If I had that crystal ball, I’d be solid,” she said. Many building managers said that overall they were relatively satisfied with the level of information they are getting and are willing to trust the police and federal authorities to keep things under control. “I understand they haven’t got everything figured out yet,” said Wes Stoginski, assistant engineer at a building on 13th Street near the Illinois Central rail line. But Stoginski also said he knows where the variables are. “In a memo titled Operation Red Zone, the protective service said the increased security will be extended throughout the South Loop area often referred to as the federal complex. It includes the Kluczynski Federal Building, the U.S. Dirksen Courthouse and the Metropolitan Correctional Center. Several buildings just east on State Street are also in the so-called red zone. 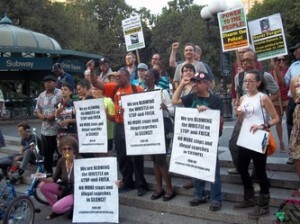 Over the last few weeks, there have been many protests to stop police brutality in NYC. I’ve been at two very dynamic and inspiring civil disobedience actions to STOP “Stop & Frisk,” including the most recent on Tuesday in Brownsville, Brooklyn, where the NYPD stops people at the highest rate. Most are young men, but I met several men way over 40, and a woman in a wheelchair who have all been stopped in the area. This campaign is not stopping, and I am so happy to be doing it with such vibrant, committed, radical people, from clergy to communists. A question came up at a meeting, from someone who had been arrested in the first action in Harlem, “Are we only trying to stop one policy of the NYPD, or are we thinking about more? I’ve been stopped and frisked in other cities, including in other countries.” It’s systematic. 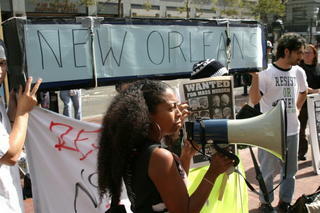 On October 22, I was at my 16th consecutive annual protest to “Stop Police Brutality, Repression, and the Criminalization of a Generation.” Once again, heart-breakingly, the parents and siblings of people killed by the police got their chance to speak. I thought mainly of how many years the toll has piled up. And these are only a few cases! Hmm, it’s systematic. Mostly, police departments don’t have the legal authority to maintain records on people not suspected of criminal activity, but increasingly, that’s just what they do. From the first week of Occupy Wall Street, officers from NYPD’s TARU, the Technical Assistance Response Unit, have ringed the plaza, constantly scanning activity, and peoples’ faces. “Only” about $3.5 billion of this amount was spent on Iraq and Afghanistan according to the Department of War. So how are they spending the other $76 billion? A look at the 2010 Washington Post Series called TOP SECRET AMERICA gives you an idea of where much of the money goes. This machine carries out a systematic, criminal repression of the people. That’s why the mission of World Can’t Wait is to end the crimes of our government. You are currently browsing the archives for the police state category.